Although born in Carson City, Frances Marguerite Humphrey spent most of her life in Reno, Nevada. 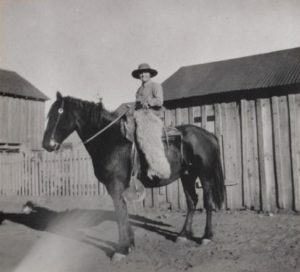 She was born June 29, 1904 to miner Francis G. “Frank” and Marguerite (Maute) Humphrey, and was the younger of two daughters. Her parents were married in the mining camp of Belmont, and Frances attended schools both in Manhattan and Carson City, as well as Reno. She was probably named after her father. Frances Humphrey graduated from Reno High School in 1922 and the University of Nevada in 1926. She was active in sports at both institutions. A formidable basketball player at Reno High, she was also an expert horseman. While at the University of Nevada, she was one of the founding members of the Kappa Alpha Theta Sorority in 1922. She remained active in its alumnae association for the rest of her life. 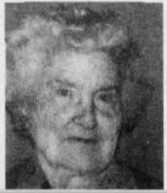 Frances Marguerite Humphrey could be confused with another Frances Humphrey who lived in the city of Reno at the same time and who was only a year apart in age. Both were members of the same church. Both graduated only a year apart. But Frances W. Humphrey, who never did actively teach, came to the name of “Humphrey” through marriage and in her later years engaged in real estate. Upon graduation, with teaching credential in hand, Frances Marguerite Humphrey headed out to her first teaching position; a rural community in northern Humboldt County called Willow Point. By the next school year, she had found employment in the Reno school system at Northside Junior High. She taught there for three years before transferring in the fall of 1931 to the “old” Reno High School, located on the corner of West Street. Frances’ salary was a whopping $1,800 a year. 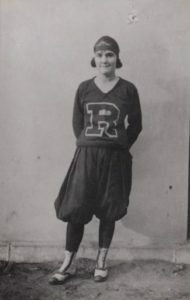 At both Reno schools, she filled a multitude of positions: among them girls’ physical education teacher and English teacher. A new Reno High School was built at the corner of Booth Street and Foster Drive in 1951 and Frances transitioned to the new facility as a school counselor. As a young teacher she was a member of the Vagabond Club, composed of teachers and young business girls who met once a month for social activities, and as a professional educator, she held offices in the Washoe County Teachers Association and later, the Retired Teachers Association. She was also active in PEO, a woman’s fraternal organization, and a dedicated communicant of Trinity Episcopal Church. Although she retired in 1965, for the next ten years Humphrey was a substitute teacher for both Reno High and the new Earl Wooster High School on W. Plumb Lane adjacent to Reno International Airport. Frances Humphrey lived independently at her East Eighth Street family home, adjacent to the Reno Fairgrounds, for 83 years without any assistance except “Meals on Wheels” in her later years. She did experience an incident in 1978 when would-be burglars broke a window to enter her house about 9 o’clock one night. She heard the glass pane break, armed herself with a stove poker and shouted, “I’m calling police.” When police arrived, they found scuff marks on the wall nearby indicating a person tried to gain entry, but her yelling (undoubtedly in her “teacher’s voice”) forestalled the break-in. She had a special relationship with the Nevada State Museum in Carson City. As a native Nevadan from two pioneer families, she had a great love of the state’s history. She was a museum supporter through the years and donated all different types of collections to the institution. Curator of History Bob Nylen started the Frances Humphrey lecture Series in 1992 to honor Frances and her contributions not only to the museum, but to the community and its youth. Frances Marguerite Humphrey passed away on November 2, 2001. She had only been in a hospital one time and that was shortly before her death. She was buried in Carson City’s Lone Mountain Cemetery alongside her parents. “Reno and Fallon Each Win a Game.” Reno Evening Gazette (Reno, Nevada), February 17, 1920, p. 8:6. “Gardnerville Girls Victorious in Extra Session Hoop game.” Nevada State Journal, Reno, Nevada, February 4, 1922, p. 2:3. “Paradise Guests and Departures.” Reno Evening Gazette (Reno, Nevada), January 5, 1927, p. 10:3. “Teachers are named for schools in Reno.” Reno Evening Gazette (Reno, Nevada), September 1, 1927, p. 8:1. “Frances Humphrey President of Alumnae Group.” Reno Evening Gazette (Reno, Nevada), March 24, 1943, p. 10:3. “Frances Humphrey New President of PEO Chapter.” Nevada State Journal (Reno, Nevada), March 5, 1952, p. 5:4. “Frances Humphrey is Awarded Life Membership.” Reno Evening Gazette (Reno, Nevada), May 20, 1961, p. 5:1. “Burglars are scared off.” Reno Evening Gazette (Reno, Nevada), January 25 1978, p.29:1. “Retired Teachers Association.” Reno Gazette Journal (Reno, Nevada), June 18, 1981, p56:4. Cobb, Ty. “Years Haven’t slowed down Reno grads.” Reno Gazette Journal (Reno, Nevada), September 3, 1995, p. 44:1, Sec. Cobbwebs. Melton, Rollan. “RHS’s 1996 Class Reunion.” Reno Gazette Journal (Reno, Nevada), July 7, 1996, p. 45:1. Melton, Rollan. “Milestone.” Reno Gazette Journal (Reno, Nevada), September 15, 1997, p. 11:1. Melton, Rollan. “Quotable Nevadan.” Reno Gazette Journal (Reno, Nevada), July 30, 2000, p. 30:1. “Humphrey had a wonderful career, life.” Reno Gazette Journal (Reno, Nevada), November 12, 2001, p. 31:1. Wilson, Walter. “Views of the Past: Lecture Series named for Frances Humphrey.” Nevada State Museum Newsletter, May/June 1994, Vol XXII, No. 3, p. 2.